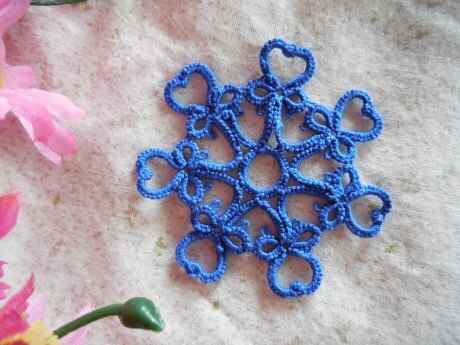 This week’s pattern is by the super talented Jane Eborall. It is an adorable peacock! Weekly Challenge #36 – Peacock designed by Jane Eborall and tatted by Natalie Rogers. Challenge Accepted – Reader Submission for Weekly Challenge #14 – Sweetheart Snowflake – Tatted by Jan B.
I love seeing what everyone tats! Thank you for sharing your beautiful work! Program: Sweetheart Snowflake with Natalie Rogers. 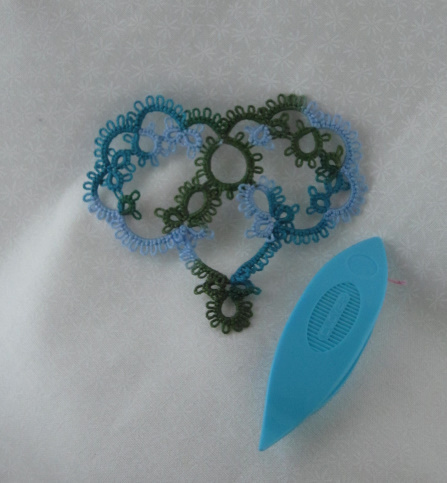 For a single color snowflake you will need size 20 thread wound CTM and a paperclip. 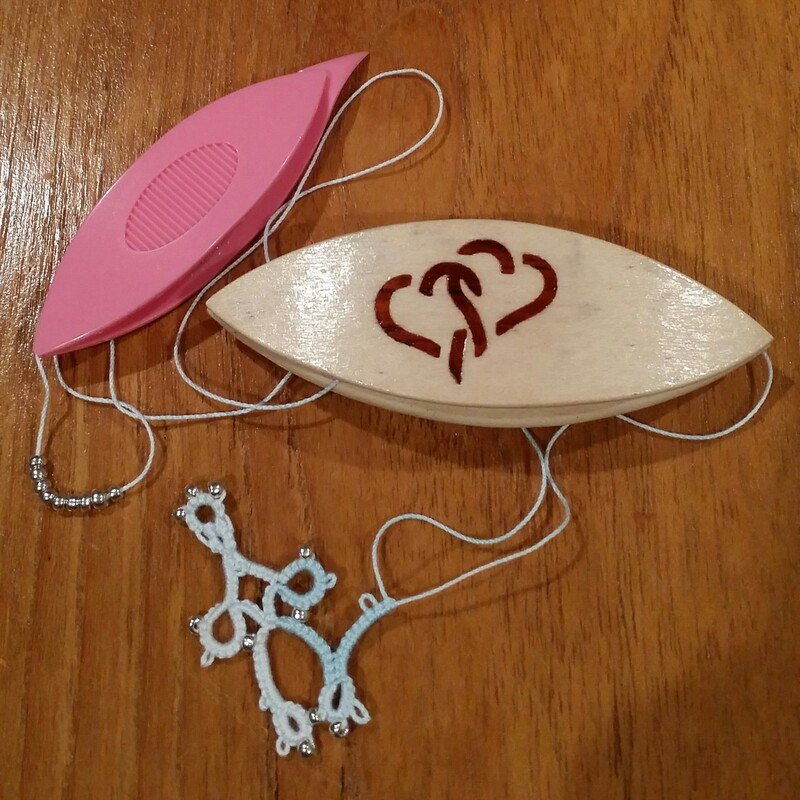 For a two color snowflake you will need two shuttles wound with size 20 thread in different colors and a paperclip. 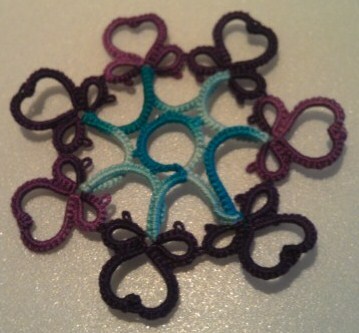 Sweetheart Snowflake (two color) – Variation of Gina Butler’s lovely Garter Pattern. 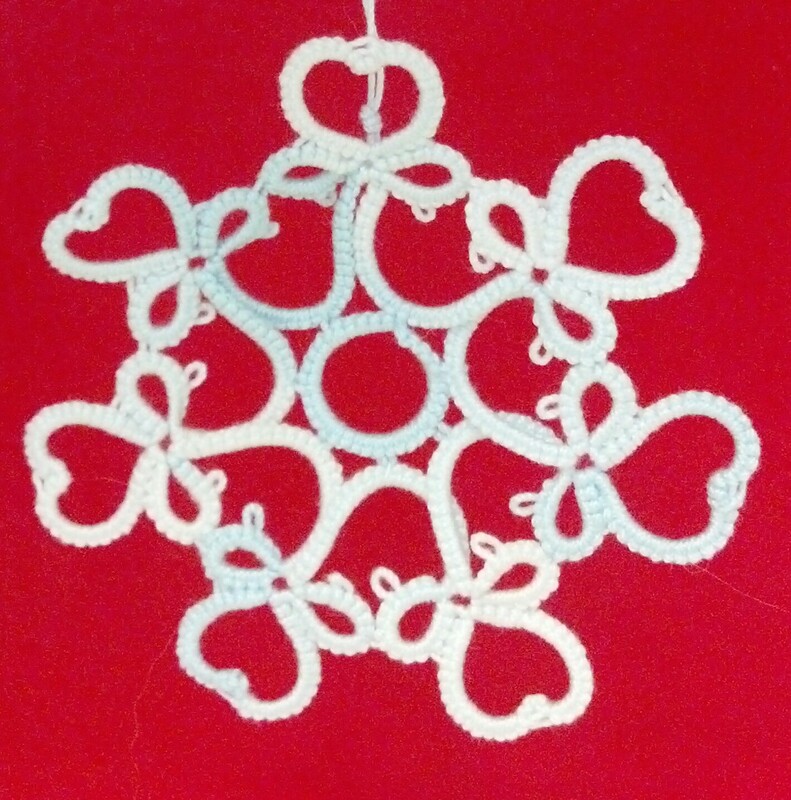 Sweetheart Snowflake (single color) pattern variation by Natalie Rogers. Original pattern is Gina Butler’s garter. 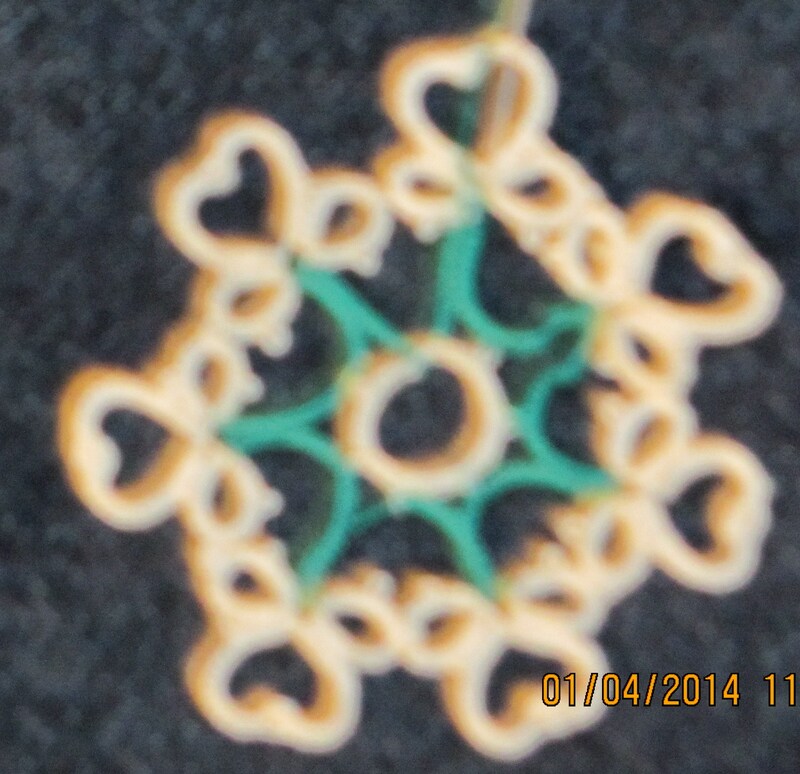 This snowflake variation is shared with permission from Gina. 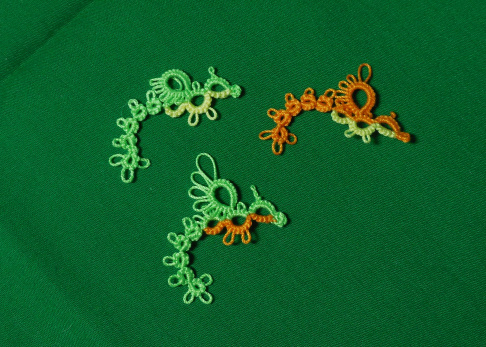 The Sweetheart Snowflake is a variation of Gina Butler’s Garter Pattern (featured here). 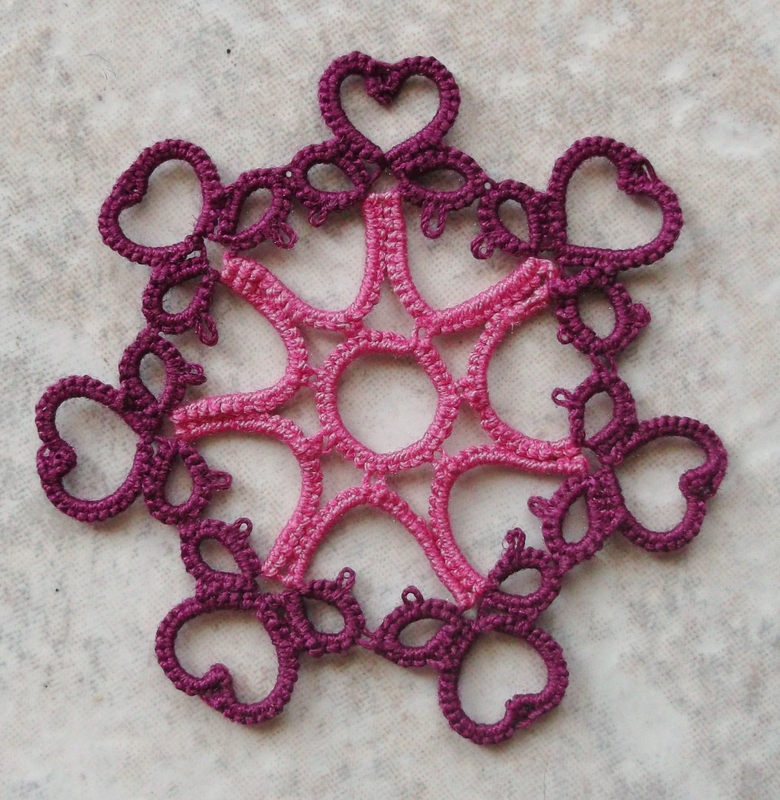 This week’s pattern is by the amazing Jane Eborall! 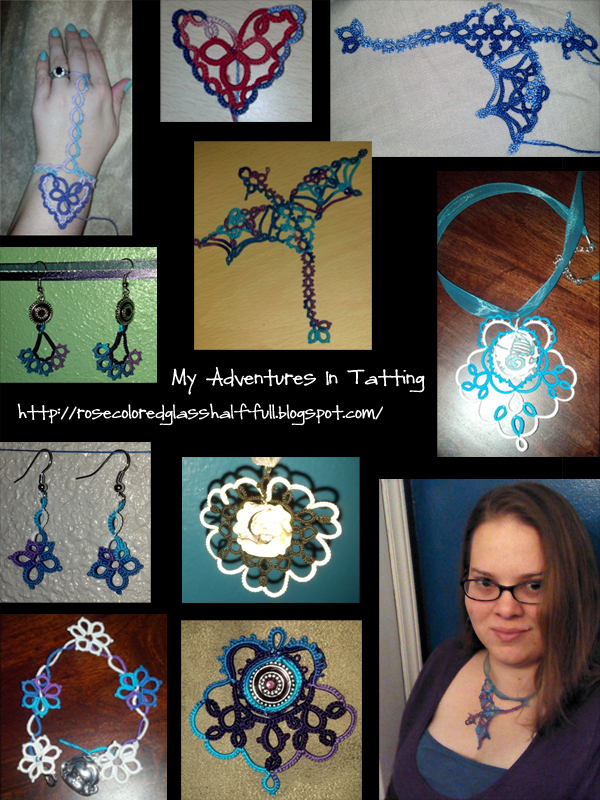 She has several wonderful patterns available for tatters around the world to enjoy. In progress Flurry Snowflake – design by Jane Eborall. Tatted by Natalie Rogers. I’m currently on a snowflake kick for my tree and this one is a lot of fun! 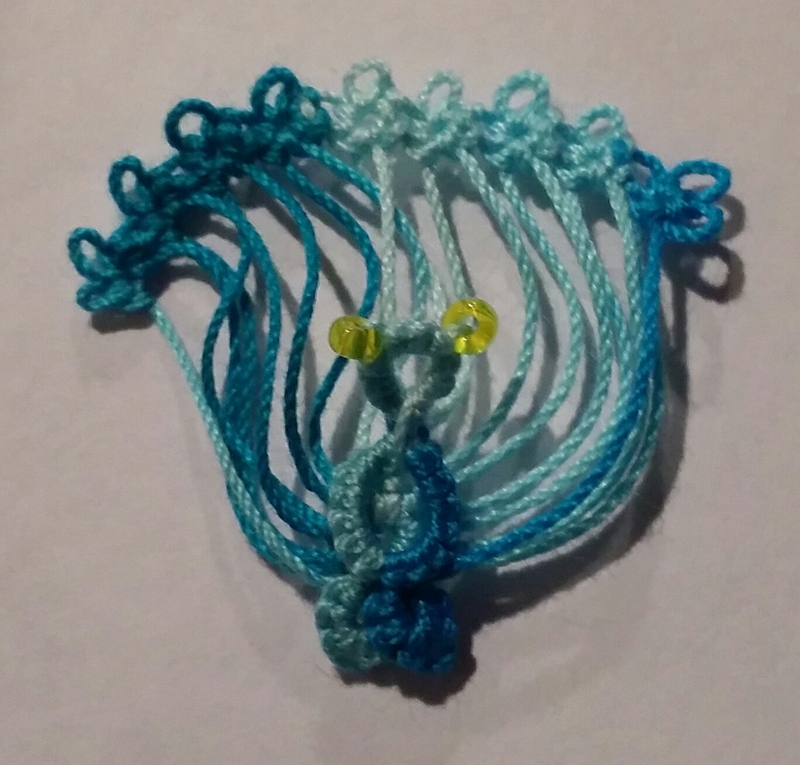 However, I’ve miscalculated the amount of time it takes me to add beads to a picot before a join. 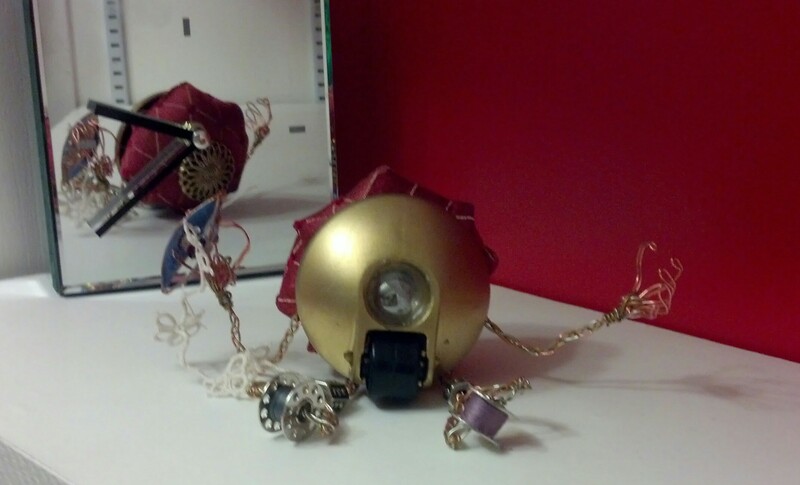 Thus, you get to enjoy an in-progress shot. I will upload my completed snowflake when it is finished and I look forward to seeing yours! 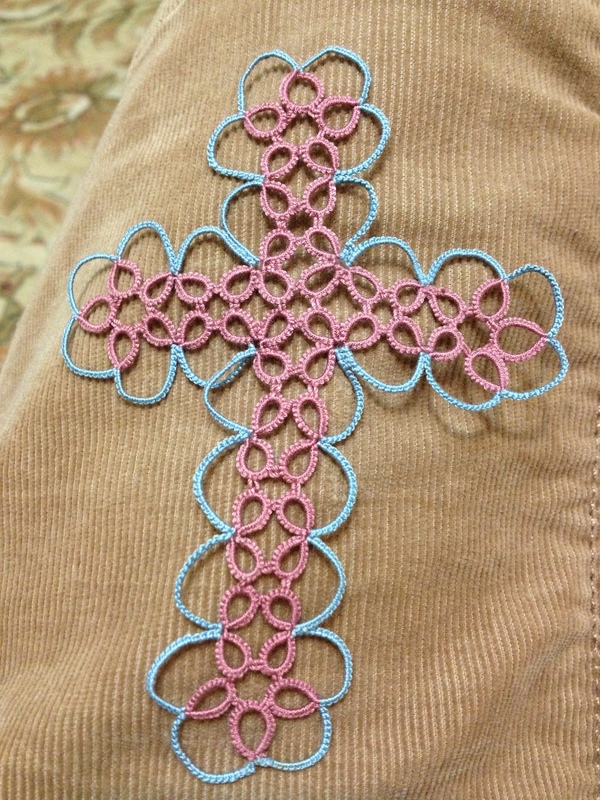 Challenge Accepted – Reader Submission for Weekly Challenge # 32 – Tatted Roman Cross – Tatted by Kristen Fink in size 30 Cebélia thread. 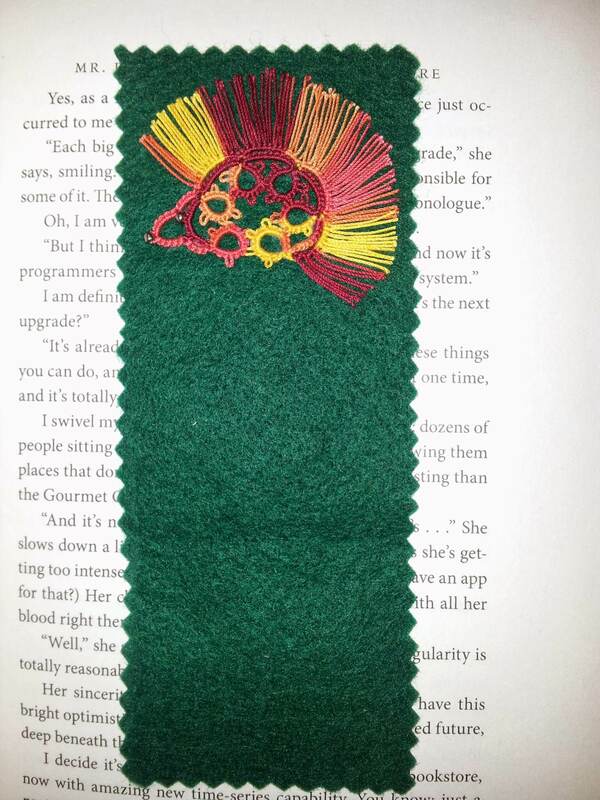 Challenge Accepted – Reader Submission for Weekly Challenge #18 – Hedgehog – Tatted by Claire Perrin “As it was for a bookmark, I used small seed beads, and glued the tatting on a piece of felt.